We’ve been talking for a while about setting up a site, but finally got ourselves into gear this weekend – we hope you like www.prejudiceme.co.uk. It’s still a work in progress, so we’d appreciate any feedback and recommendations of other things to include. 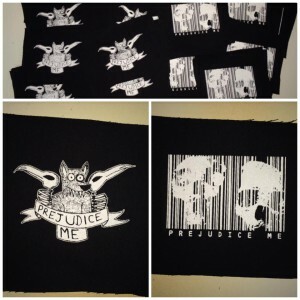 In other news, we’ve just had two new patch designs delivered (see pic below – thanks to EHC for printing them, and Alex and Dan for the designs). You can buy one for 50p, but we’re also giving one away free with every order.